My 6 month old is suddenly barking alot. There is nothing there to bark at but she won't shut up. She is very shy and skittish and runs the other way from people and barks. It's the barking at nothing that is making me crazy. My question is, does anyone have experience with a bark collar on a Chow? Any thoughts or suggestions on this would be appreciated. Is it out and out barking or is she "talking?" Talking is lots of little sounds mixed with a ruff ruff or haaaaarumpf. My Kimba would do that with me while washing dishes. She would sit at the sliding glass window and we'd have a "conversation." I would suggest talking back when your pup barks. Ask questions, like, "What's that?" and, "Oh really? Well, what else?" This may distract from the out and out barking. Kimba would also start barking if she saw something out the window and usually if we said, "Who's that?" she'd go off in a flurry of barks which meant we then needed to take her to the door so she could see there was no one there. Keep in mind your pup may hear or see things that you don't and exploring them with her helps to reassure her that you're in control and that everything is "okay." You can even say things like, "Show me," then follow to where she takes you. Of course, if she goes no where then everything I said was for naught. But, I hope this helps somewhat. Not sure what a bark collar is, so I'm interested to see what other more experienced chow owners have to say. I am with Cherriemater. Engage your dog with a conversation and ask her what she is barking about. There is nothing there to bark at but she won't shut up. She is very shy and skittish and runs the other way from people and barks. The situation is that you see nothing to bark at. Things might seem different if you were only 12" off the floor, very young and unsure of the situation. You are the Alpha dog, and it is your job to reassure the others in the pack that you are in charge. Your puppy sounds like my Ursa. At four years old, she is still somewhat shy and skittish, especially when she is alone without any leadership. For your peace of mind and for hers, you need to work closely with her on socialization and acceptance of new situations. You will have to work through each situation one at a time, but in the long run, it is possible to make your dog more sure of herself. When we first came to Gulfport, Malachi would bark at the front door at night. I had no idea about what was upsetting him. I ended up sleeping beside him on the rug at the front door. It wasn't that long before he started to bark. I could hear a "Whoo whoo whoo," and realized it was just an owl. I was able to reassure him that it was not a danger. He did not know, and he was doing what he is genetically programmed to do, which is to bark at unknown things that might be a threat. Your puppy is young and unsure about what to do. The only thing she knows is to bark at anything that new and not understood. That could be a lot of things. The airplane overhead, the kid on the skateboard, the emergency vehicle siren, the car alarm in the parking lot probably are not noticed by you, but your puppy hears them and does not understand. Skittish and shy behavior is genetically a part of some chows, and this is your puppy. You need to work with her by introducing her to new experiences that are not threatening and provide her with reassurance that things are ok while providing these experiences. Just stopping the dog from barking is treating the symptoms. It is the uncertainty that she is experiencing that is the underlying cause. You MUST work with her to make her a poised and confident young lady. Doing so will be rewarding to both you and her. See Oceans comments on training classes. Good classes can be helpful, especially if you are not familiar with dog training. 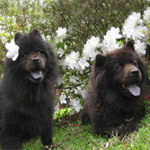 If possible, try to find someone who has worked with chows, because not all trainers are suitable when working with chows. I do not agree with bark collars, especially if you do not know what she is barking for. If it is due to being nervous, which sounds like the most likely cause, then using a bark collar will just give her more reason to be nervous. She will associate the spray/ shock with whatever she is barking at, and cause her to be more nervous, possibly leading to agression. I am no expert, so I am not certain on this, but I have watched a lot of dog programs and this subject was on one of them. I agree with the idea of talking to your dog about the barking. Remember that their senses are incredibly more sensitive than ours and the barking may simply be to alert you to something. I have found that with my Loha he will usually quit barking at any particular stimulus once I acknowledge the situation and assure him that we are OK nonetheless. I literally tell him that I am OK and that he is OK and that usually does the trick. Loha's Dad is correct. I will actually go and look and listen (at least act the part) when the dogs bark. This lets them know that the pack leader is in on the situation. Typically, it is not a major issue, and telling them that it is ok generally resolves things. Ursa's daddy and Loha's Dad have the same experience as mine. 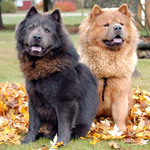 My current chow and my previous chow would quit barking once I went to see why they were barking. If I react nervously the barking might escalate, as in a stranger at the door, or a noise I don't like. If I say "it's ok" the barking quits. I suggest you let your chow know you take his barking seriously. That way he will be a better watch dog and learn when to bark appropriately. As a puppy when ours would bark, we would go look. If it was nothing important we would just gently touch him and let him know it was ok and come on back and relax. After a while, you will learn to recognize the significance of the different sounding barks your chow makes. Mine has a bark that says "I think I may have heard something, but I am not sure." Then he has a "somebody is here, but they may be ok" bark, and the real big boy bark is "there is someone here that I feel is a danger." He even has an "I can see or hear another animal and I want to go play with them" bark. Like others have already said talk to your chow and listen to what he is trying to tell you. Onthemove is correct with his points. I know that my two look to me for ques on how to respond to different situations. Taking your dog's bark serious does provide positive feedback for the dog. She will quickly learn from you which situations she perceives are worthy of an alert. It is also true that they have different sounding barks for different things. They are trying to communicate to the rest of the pack and/or send a message to animal or person that they have detected. I had to use one on my chow when he was a puppy. After a month of his not stop barking at night I could no longer take it and bought a collar. Solved the problem in two days. I never used the shock setting. I bought one that was a dual buzzer/shocker and only used the buzzer setting. If he started barking just buzzed him for 10 seconds and he would stop. The noise seemed to distract him, he would kind of turn his head and look around. Had to buzz him three or four times the first night, then maybe twice the next night. After that he would make it through the night without throwing a temper tantrum. After two weeks I didn't even bother putting the collar on anymore. I didn't seem to prevent him from barking under normal circumstances. He's still bark up a storm if he hears or see something outside, just no more outbursts when was put in his pen for the evening. I don't really agree with the bark collar either. Remember that you little chow chow is now exploring the world and is slowly gaining awareness of his strength. My chow, Drogo is 7 months old and has started barking at things and sounds that do not really seem important to me. I believe that his guard dog qualities are coming to the surface and he needs to bark and learn until he will learn on how to filter things. I took him for camping for 3 days and he was barking at every person passing by but did not try to tell him off as for him it was a normal thing to do. as the pack leader, I was reassuring him that a sound, or shadow or person passing by was ok. That's my view anyway.